According to the Sun Sentinel, Delray Beach, Florida is among the best cities in Florida for retirement. 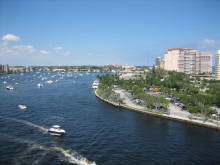 One of the unique aspects of Delray Beach is the fact that it's popular with both younger, and retirement aged individuals. Delray has an excellent bar, restaurant and nightlife thing, so if you're looking to get out on the town, you'll have plenty of options. For those looking for a quieter day, nothing beats relaxing on one of Delray's beautiful beaches with a book. The community of Delray Beach is upscale, yet still offers affordable housing as well as the many breaks for seniors the state is known for offering. Should you decide to retire in Delray Beach, one neighborhood worth considering is King’s Point, where beautiful ocean views and breezes are yours to enjoy. Match me with 3 top Delray Beach Realtors!